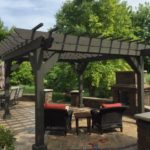 You’ve created an attractive outdoor space. Why let that hard work disappear at twilight, with the ease of an automatic timer or simple smart phone app and a few strategically placed landscape lights, you’ll roll back the darkness and put it all on display. Done right, landscape lighting makes the most of what you have by highlighting your home’s outdoor features and drawing attention to prized plantings and trees. Most landscape lighting these days is low voltage, and for good reason. In contrast to 120-volt systems, it’s safer to install and less expensive to put in. And tho’ low voltage lights use ten percent of the power, there is no limit to the lighting they can achieve. By selecting the correct hardware, a beautiful lighting scheme is easy to create. Please contact us to maintain your existing landscape lighting. We will inspect each fixture for proper alignment, replace halogen bulbs with brighter power saving led lights, and ensure the intended beauty of your outdoor lighting system. We have a passion for landscape art, exceptional design sense, and extensive lighting knowledge that makes us the perfect choice to create a stimulating and functional lighting system for your outdoor space. Our knowledge, combined with your vision for your space, gives us everything we need to create all of the key elements of an outdoor lighting system, to create the look and feel you want to achieve for your home or business.